This Jamie Oliver recipe is from the latest Jamie Magazine: http://www.jamieoliver.com/magazine/ – Issue No 47 Easter 2014. It’s a relatively simple recipe, the only complicated thing is to marinate the lamb overnight. The recipe suggests the cooking time for the lamb is 45 minutes. I think a little longer is necessary to make sure the lamb is cooked through. To a make the marinade, heat the cream and butter together in a saucepan over a low heat, until the butter has melted. Pour half into a bowl, reserving the other half. Add all the remaining marinade ingredients to the bowl along with1 teaspoon of salt, then mix well. Submerge the lamb in the mixture and leave to marinate in the fridge for at least 8 hours, or overnight. Preheat the oven to 200 degrees C. Add the rice to a saucepan of salted water, bring to the boil and cook for about 5 minutes – it should still be a little undercooked. 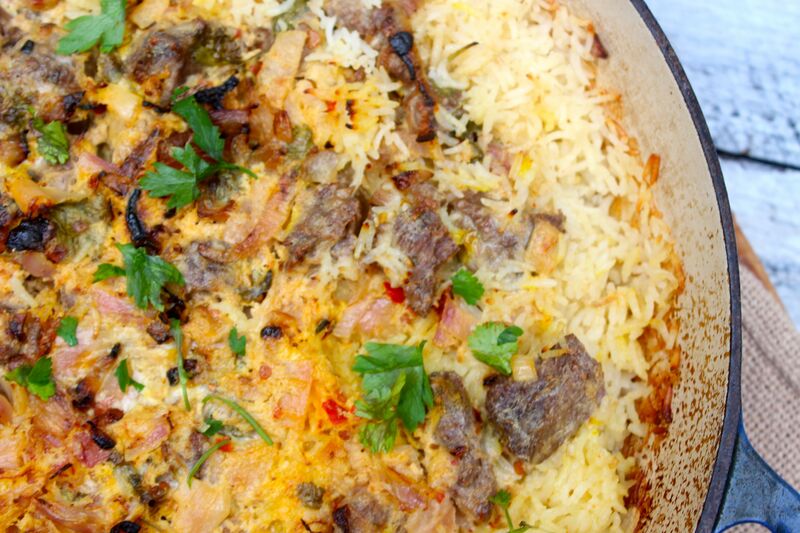 Layer the rice and marinated lamb in a heavy-bottomed casserole or oven dish. Pour over the remaining cream and butter mixture, then scatter over the crispy fried onions and most of the coriander. Cover the dish with a lid or a layer of aluminium foil and cook in the oven for 45 minutes, until the meat is done. Serve topped with the remaining coriander leaves. 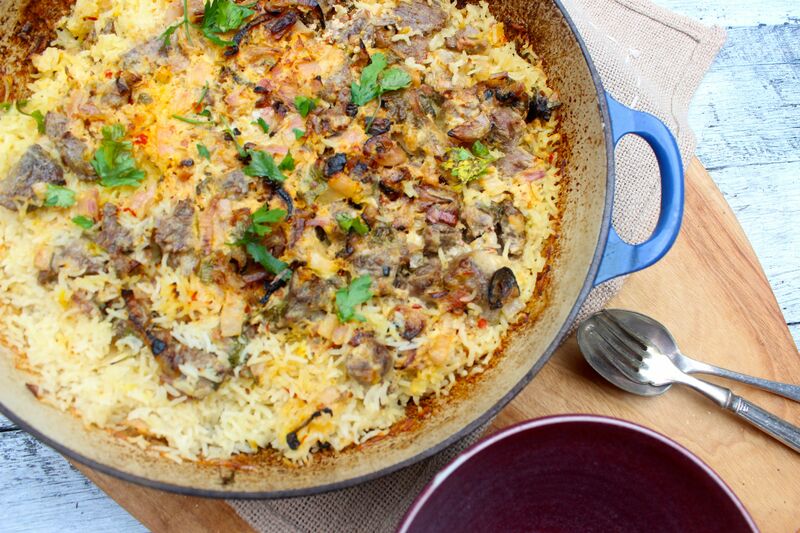 Posted in Jamie Oliver, Reviews, Savoury Food and tagged basmati rice, biryani, chili, Easter, Greek yoghurt, Jamie Magazine, Jamie Oliver, lamb, marinade. Bookmark the permalink.